Today I'm sharing a fun fact with you that readers may not know about me. I grew up with my Dad's family owning and running an ice cream restaurant. Everyone always asks me if it's odd that my father runs an ice cream business and I am a nutritionist, but one of the best things about this odd pairing has been my exposure to the food industry since I was really little. For as long as I can remember we always had ice cream available, but here's the thing: because it was so available I never really wanted it. Even still I'm not the biggest fan of ice cream. Now frozen yogurt is a different story. 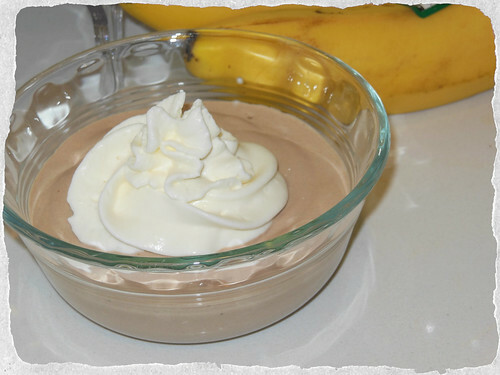 This recipe was inspired by my attempt to create Paleo frozen yogurt or soft serve. 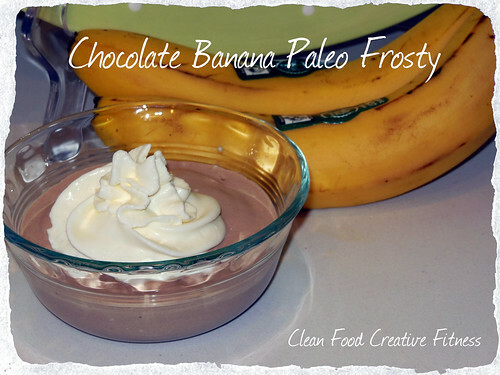 It came out really chocolaty and creamy and I was actually really surprised that it was all Paleo. The name is inspired by a frosty, but I've never actually had one. If I did, though, I imagine this is what it would taste like, and I thought this came out looking just like one! In a food processor blend your bananas until they started to break down into smaller pieces. Next add in the thick part of your coconut milk from the can. You will scoop this off of the top. The bottom will still be a liquid. Continue to blend until it thins out to a soft serve like consistency. Add in your cocoa powder and almond butter and blend 1-2 minutes longer. Ice cream or frozen yogurt??? What's your favorite? Is there any food you see as a "special occasion" food? So you're saying cold coconut milk separates and gets solid. Sounds delicious. Saved and will try this recipe.